Clean mushrooms with a damp cloth and remove their stems. Place in a glass dish, stem (gill) side up. To prepare the marinade, in a small bowl whisk together the vinegar, water, sugar, garlic, cayenne pepper and olive oil. Drizzle the marinade over the mushrooms. Cover and marinate in the refrigerator for about 1 hour, turning mushrooms once. Grill or broil the mushrooms on medium heat, turning often, until tender, about 5 minutes on each side. Baste with marinade to keep from drying out. Using tongs, transfer the mushrooms to a plate. 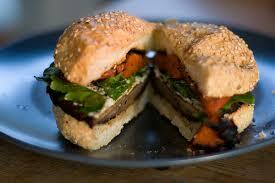 Place each mushroom on a bun and top with 1 tomato slice, 1 onion slice and 1/2 lettuce leaf. Serve immediately. In a blender, combine the orange juice, soy milk, tofu, honey, orange zest, vanilla and ice cubes. 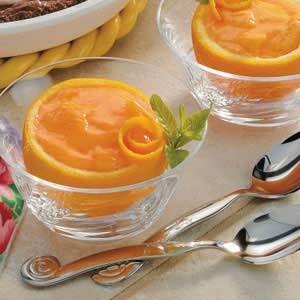 Blend until smooth and frothy, about 30 seconds.Pour into tall, chilled glasses and garnish each glass with an orange segment. Whip up this frothy cooler in minutes — it tastes like an old-fashioned Creamsicle. For best results, start with ice-cold soy milk and use freshly squeezed orange juice. Creamy, custard-like silken tofu adds extra body. For additional calcium, use calcium-fortified orange juice. In a small bowl, whisk together the yogurt, lime juice and lime zest. Cover and refrigerate until needed. 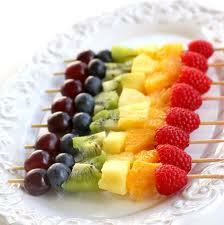 Thread 1 of each fruit onto the skewer. Repeat with the other skewers until the fruit is gone. Serve with the lemon lime dip.